FUN & FUNCTIONAL: Colorful, exciting characters and patterns make this bag super stylish. Your child is sure to find something they love with the variety of designs offered. Don't forget to make it a set with other coordinating Stephen Joseph products or customize it to make it your own! SPECIAL FEATURES: With zipper pockets, unique embroidered and appliqued designs, and the cutest coordinating zipper pull, there are plenty of great features on this backpack that set it apart from your average bag. Adjustable straps and a handy hanging loop also make it kid friendly and parent approved. 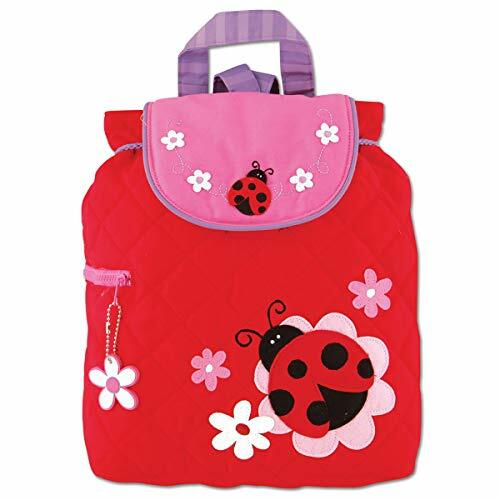 SPACIOUS DESIGN: Measuring 12"x 13.5" this bag offers plenty of room for all the necessities and is a great size for young children! HIGH QUALITY: With a durable construction and flexible cotton twill material, you can be assured this bag will be your go-to whether you use it as a diaper bag, backpack, or travel bag. It's even machine washable! Fully lined with a magnetic snap and drawstring closure, it will secure and protect all the essentials inside.